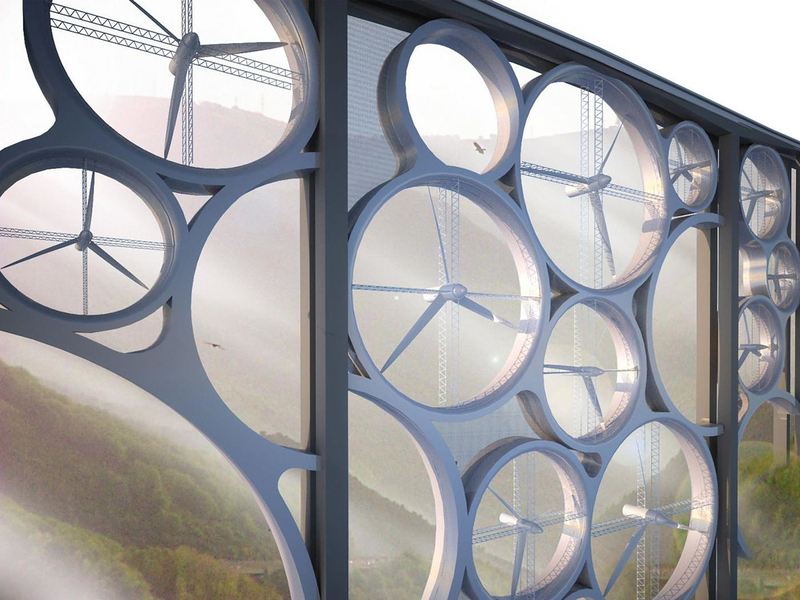 HomeBlogArchitectureSolar Wind a Viaduct with built-in Wind Turbines. Solar Wind is an exciting bridge concept that incorporates wind and solar energy into its design, generating 40 million kilowatt-hours per year and looking pretty slick. The proposal was realized by Francesco Colarossi, Giovanna Saracino and Luisa Saracino. 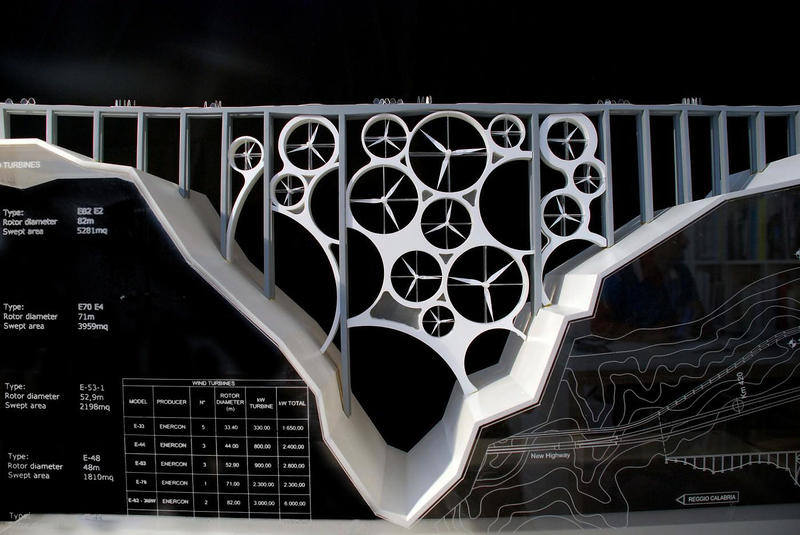 The design team conceived the Solar Wind project for a contest that aims to repurpose some old, unused viaducts near Calabria, a region in southern Italy. The old viaduct was initially planned to be demolished, yet it would cost €50 million to demolish the colossal construction and remove all the waste. So town official decided to run a contest for proposals that would re-use them in an environmentally friendly way, the Solar Wind bridge was awarded with second place in the competition. Solar Wind is a hybrid system proposed (combining solar and wind power) allows for a continuous production of Energy. 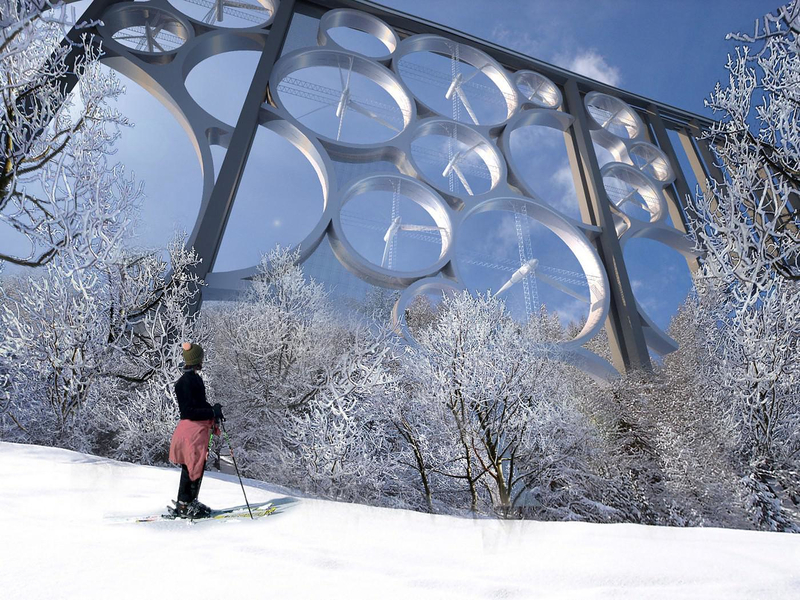 The project is based on the idea of utilizing the space between the pillars of the existing viaducts to house a system of wind-powered turbines that will be integrated into the structure. This ensures contained land use and therefore a reduced impact on both landscape and environment in addition to re-designing the visual profile of the viaduct. In the proposed application it contains 26 wind turbines, which according to the designers could produce a staggering 36 million kilowatt hours of electricity every year. The proposal also includes a solar-paneled roadway which is capable of producing an additional 11.2 million kilowatt hours per year. 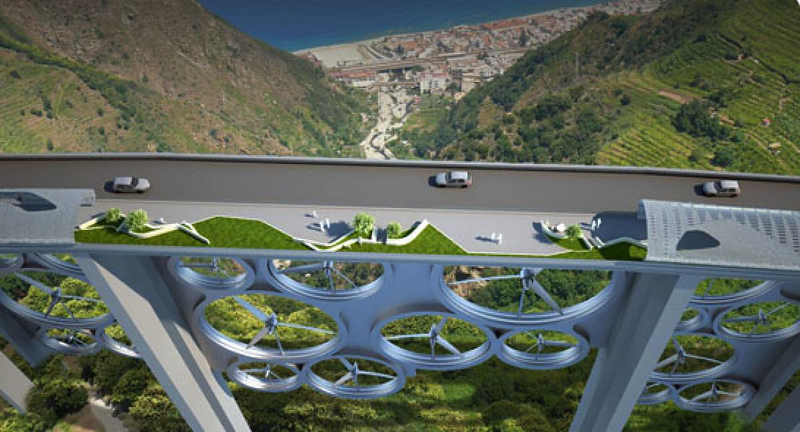 The design turns the entire viaduct into a park with spaces to pull over and enjoy the view off the Italian coast. The solar park proposed would stretch the full length of the inner carriageway, with the outer carriageway remaining reserved for the transit of vehicles. It is conceived as a green “promenade”, along which there alternate panoramic viewing points and entirely self-sufficient solar greenhouses. As with city farms, visitors to the park would be able to stop and buy the local products grown in these greenhouses. The asphalt is substituted with a high-tech road surface of a kind already in use in the USA (“solar roadways”). The road surface itself collects energy as a part of a power-generating system composed of a dense grid of solar cells coated with a transparent and highly resistant form of plastic. All in all, the entire Solar Wind system would be capable of producing around 40 million kWh per year, enough energy to provide power for approximately 15.000 families.